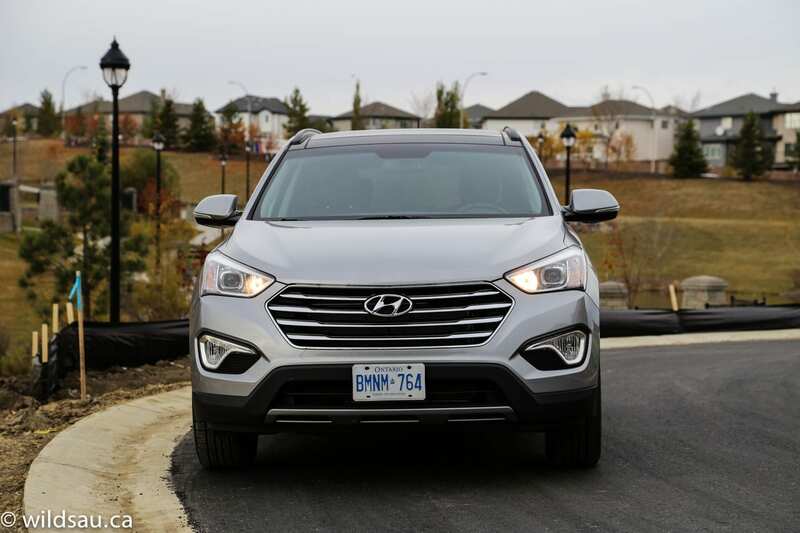 After enjoying my time with this vehicle’s little brother, the Santa Fe Sport (which is AJAC’s 2012 Canadian Utility Vehicle of the Year), I was looking forward to evaluating the grand 7-passenger Santa Fe XL. Though much of it appears familiar, Hyundai has went to some lengths to distinguish it from the Sport, and I think they did a great job. Also, I found it to be a significant improvement on the outgoing Veracruz. 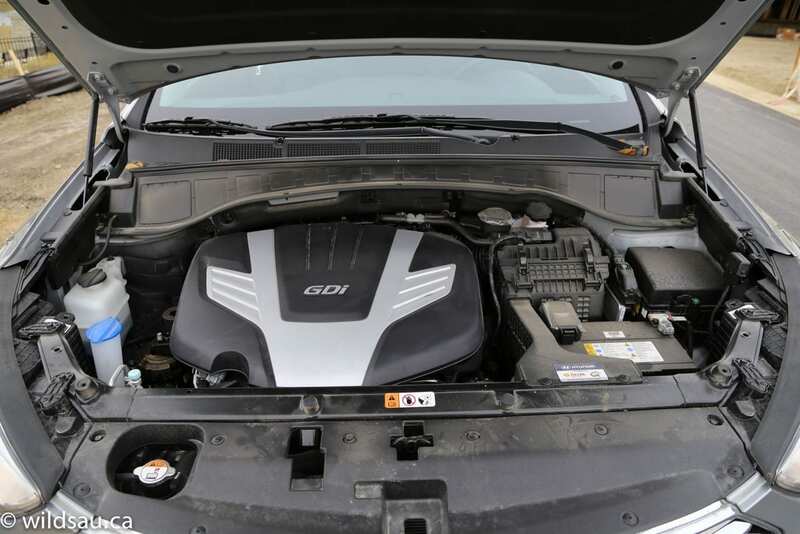 The XL gets a normally-aspirated 3.3-litre V6 – no turbos here. The mill puts out a solid 290 horsepower at 6400 RPM and a slightly less-than-expected 252 lb.ft of torque at 5200 RPM. It routes its power through a 6-speed automatic to all four corners, via a front-wheel-drive-based all-wheel drive system. A vehicle this size isn’t going to set any fuel economy records, but it does alright at 11.7 L/100 km (20 mpg) in the city and 8.0 L/100 km (29 mpg) on the highway. Surprisingly, my average of 12 L/100 km (19.6 mpg) was barely off the rating, during a week of city commuting and several highway sprints. Not bad for a 4096 pound, 7-seat all-wheel drive vehicle. Not bad at all. 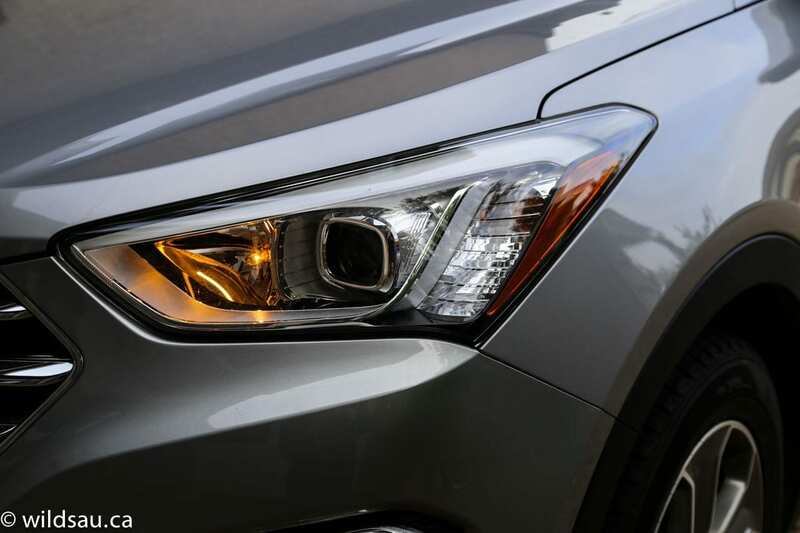 Hyundai describes their design language as “Fluidic Sculpture” styling. Let me be the first to say I can’t stand that phrase, but I’ll give them credit for a nicely integrated product line that’s really starting to be easily identifiable. 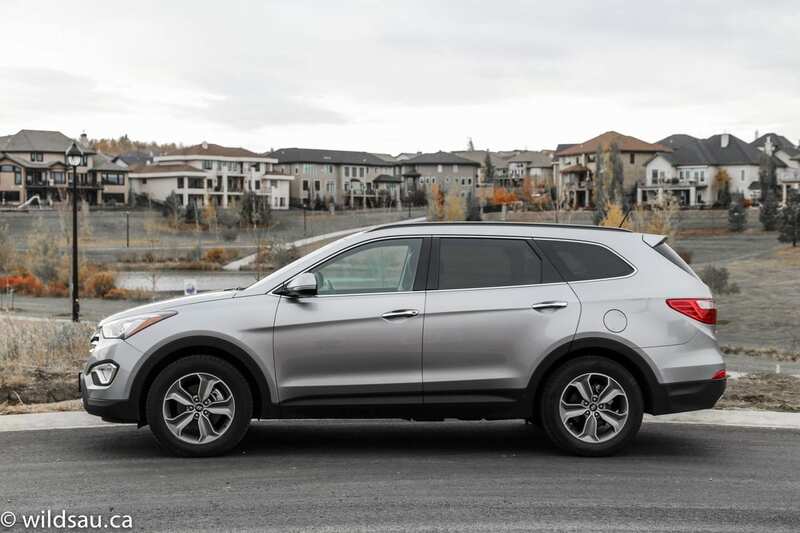 I liked the lines of the Santa Fe Sport, but truthfully, I like the XL even better. Hyundai managed to hide that extra row and leg room that they tucked into the additional 215 mm in a very graceful way. The Santa Fe XL has a bold design, but it remains restrained enough that it will age gracefully – perhaps more so than the Santa Fe Sport. The biggest differentiation between this and the Sport model is the difference in the side window – where it comes to a sharp point at the rear on the Sport, the XL’s stretches out more and has a more angled rear line – I prefer it here. Up front, the XL sports a very visible chrome grille flanked by swoopy LED driving lights and cool fog lights, while the rear end gets its own tail lights and nicely integrated exhaust tips. 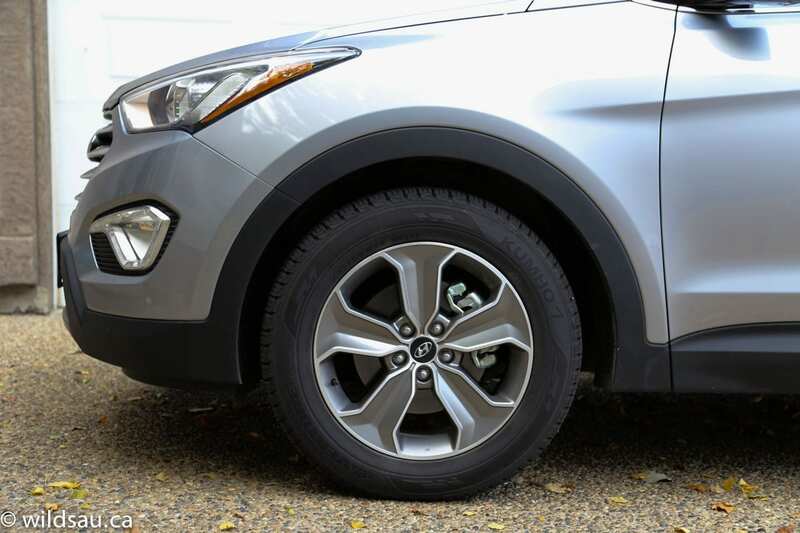 The wheel wells are filled by handsome 18-inch rims wearing 235/60-sized rubber. The wedge styling is slick and clean, and I really enjoyed it. On that note, a number of people commented on the exterior styling – all of them positive. Inside, you’ll find a combination of nice soft-touch plastics (some endowed with some pretty adventurous textures) and a decent faux wood trim. The styling is fresh, using angular panels here and there, but I like that it remains clean and doesn’t go off into left field. 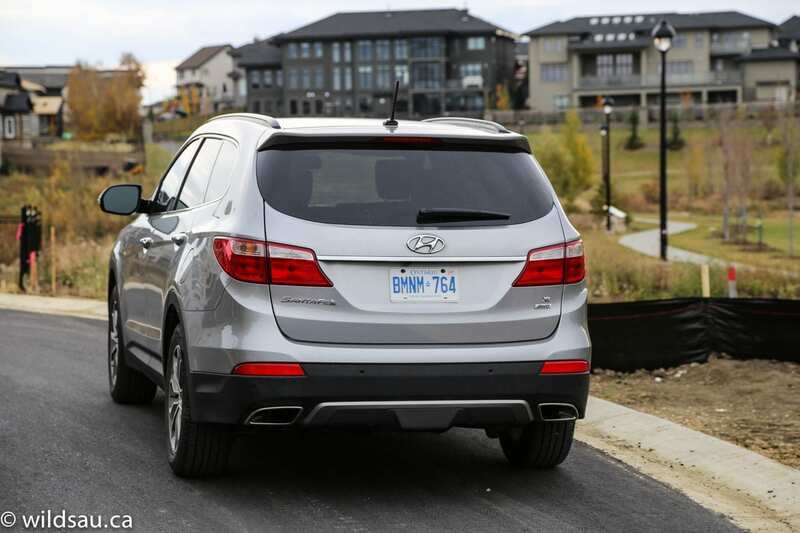 You’d be hard-pressed to tell the difference between the two Santa Fe models from the driver seat. The XL’s cabin is large – I found lots of head room for my 5’10” frame. 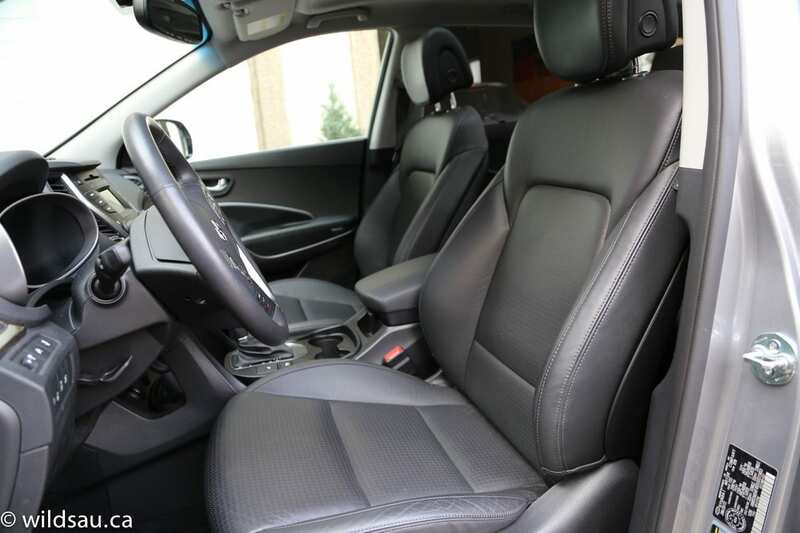 Plant yourself on the very comfortable leather seats – you’ll find them to be power-adjutable and heated – and they offer a reasonable amount of support for when you hit the curves. 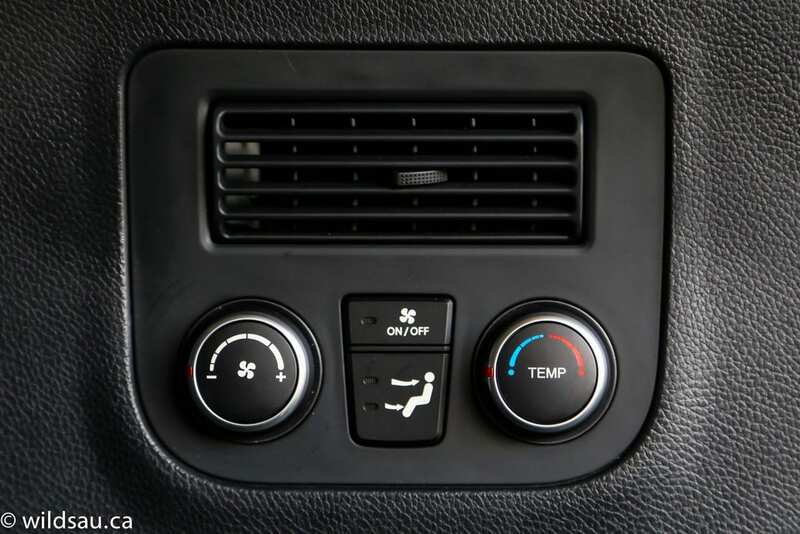 The heated steering wheel has controls for cruise, the steering mode, the driver information screen, phone and media functions. Behind the wheel sit two big, easy to read gauges. Between the gauges is a very crisp, clear driver information screen. 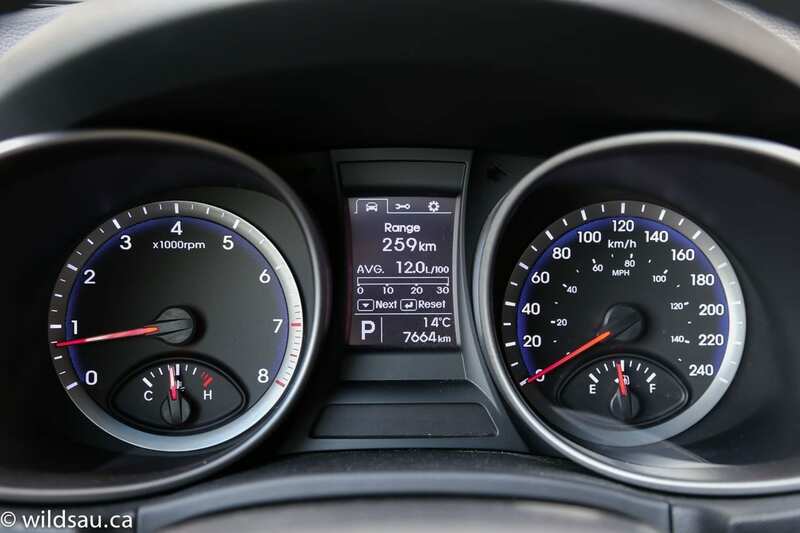 It allows you to see what’s playing on your media system, some vehicle settings, fuel economy (range, average consumption), and 2 trip meters. At the top of the center stack is a small 4.3-inch screen that handles the audio system, your phone and the vehicle settings. It’s surrounded by a few hard buttons and knobs – they’re there to help you manage the major functions. The screen is easy to read, but it comes across as a bit small by today’s standards. Upper trim levels have a larger screen. 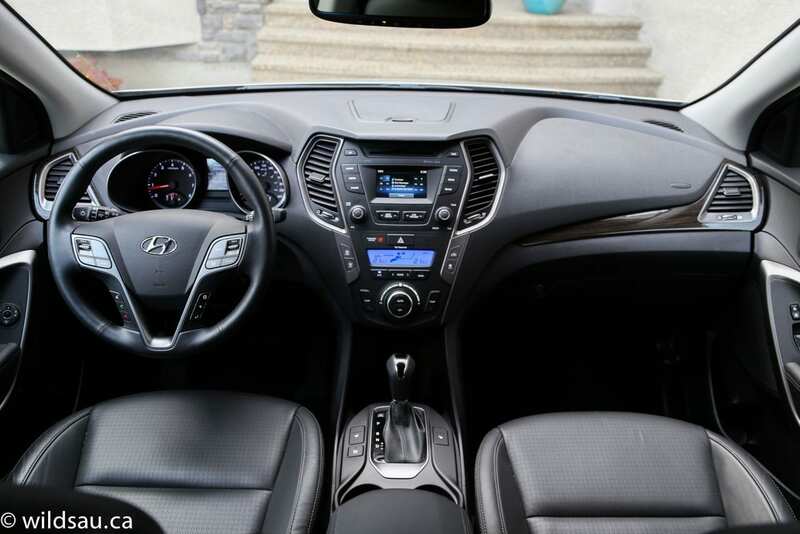 The audio system sounds fine, and happily feeds off any source you can think of – AM, FM, satellite, USB, auxiliary, Bluetooth streaming… Below the screen is a dual-zone climate control system. The screen also acts as the monitor for your backup camera. 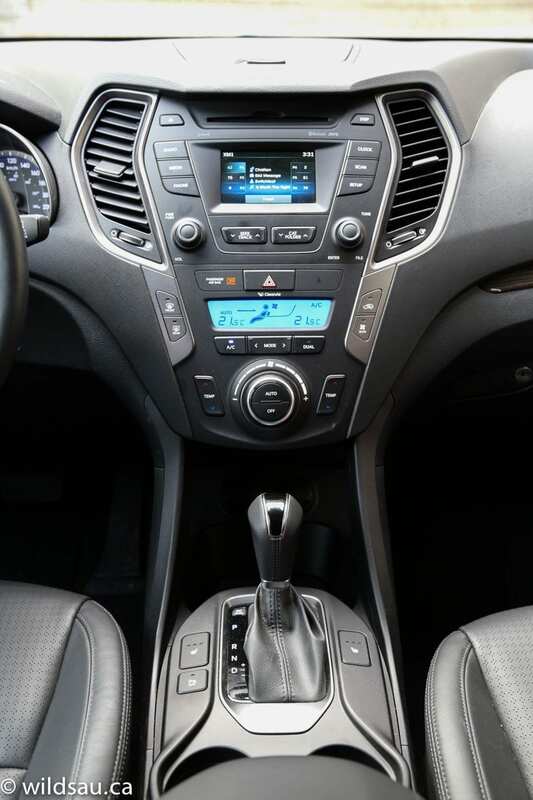 The center console holds the gear selector, dual cupholders and an armrest. Overhead is a ridiculously awesome sunroof that is roughly the size of Mongolia – the front panel tilts and slides, and there is a powered sunshade that can cover part of (or the entire) glass area. 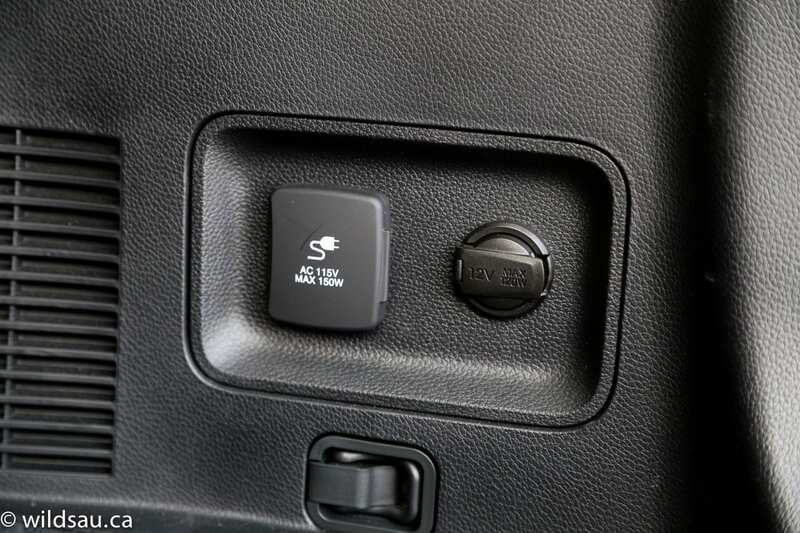 There’s a power lift gate which can be opened from the front seats, using the key fob, or with buttons on the inside or outside of the trunk lid. There’s also a three button HomeLink universal garage door opener for good measure. You’ll find three seats in second row, and they slide and recline. They are very comfortable and heated (the two outboard seats), with tons of legroom (50 mm more than the Sport) and headroom. In terms of convenience, you get two seatback map pockets, a 12V plug, adjustable air vents on either side (so much better than at the back of the center console where almost everyone else puts them! ), and a middle seatback that folds down to become an armrest with two cupholders. Our family appreciated the manual sunshades on either side. The second row gets two sets of LATCH anchors for kids’ seats, and all three of our kids were very comfortable here. This row folds 40/20/40 so you can fold the middle down to transport longer, skinnier items while still using the two outboard seats – great flexibility. And the street-side seat tilts and slides forward with a single lever, which allows for quick and relatively easy access to the third row. Here’s where the XL earns its keep. Its third row has two seats. The seat bottoms are low to the ground and your knees have to come way up which means the seats are better suited to children, but I could actually make it work with legroom and head room back there. Each side has a cupholder and a little storage space, and there is an independent rear climate zone with controls in the third row – nice! As happy as our family was in the second row, our two bigger kids were much happier with the space back there – a place to call their own. I liked the large drop-in area ahead of the center console under the center stack – it’s open from either side or you can reach it behind the gear selector – unfortunately, it’s not the easiest space to get to but it’s highly useful once your hand finds a way into it. This bin area is also home to two 12V plugs, as well as the auxiliary and USB plugs. 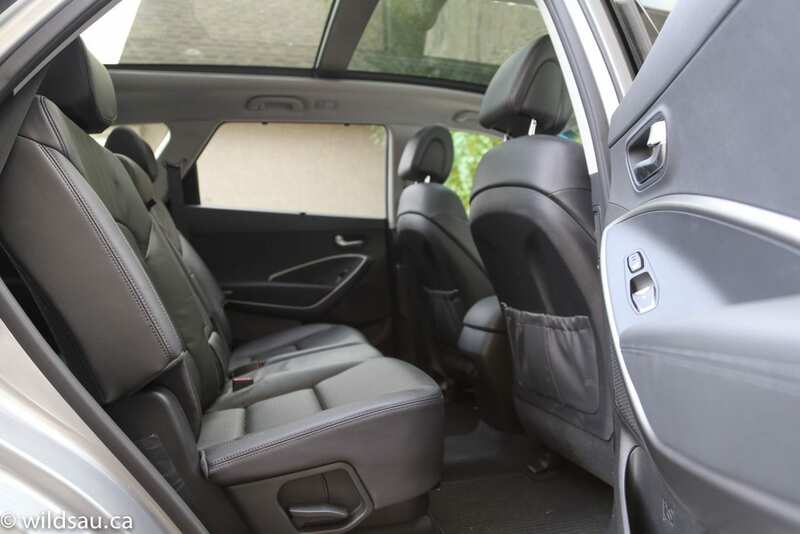 I liked the large glove compartment, the big useful door bins, and the large space underneath the armrest. The center of the dash has a rubberized bin under a pop-up lid – I found the lid to be quite sticky, never opening on the first try. The XL provides plenty of cargo space too. Even with the third row in use, you have a useful trunk of 383 litres. The third row folds (in a 50/50 split) flat, and you’re looking at a big 1159 space. There are a 12V and a 115V household plug in trunk – why doesn’t everyone do this?! 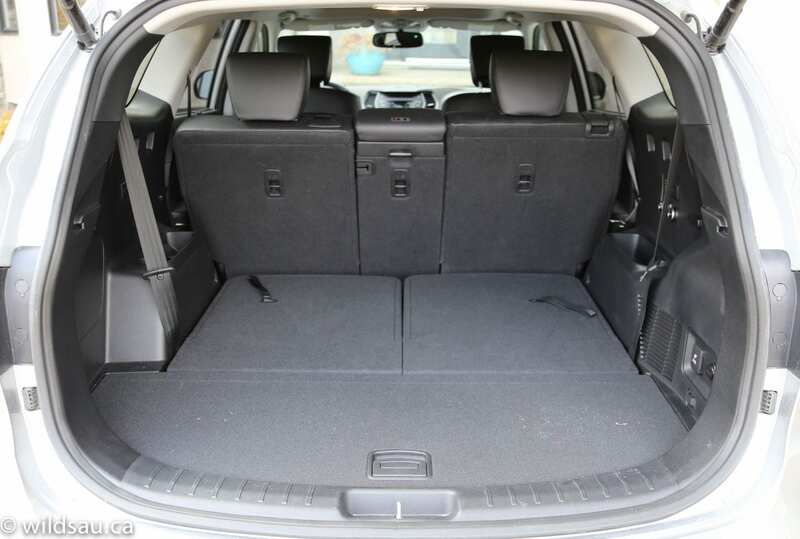 Hyundai also provides a little bit of underfloor storage – it’s not huge, but useful for valuables, etc. 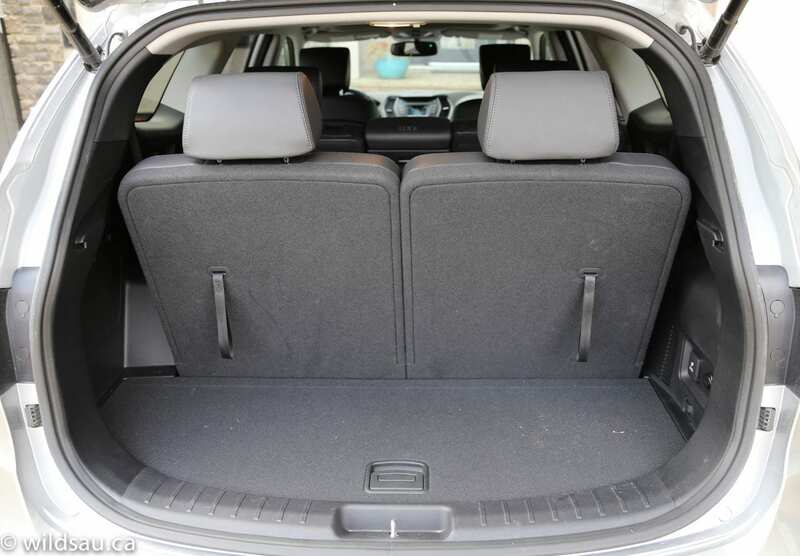 And finally, if you need the space, you can fold the second row using remote release latches in the trunk and you’re left with a gargantuan 2265 litre cavern. The V-6 provides plenty of power off the line and it always feels refined and smooth. It’s not a quick vehicle, but it’s never slow either – a healthy compromise in this class. 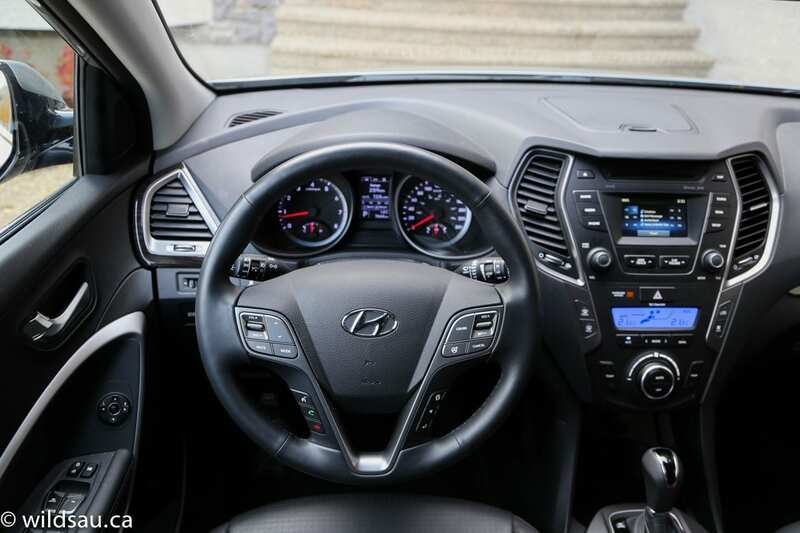 Hyundai throws in an active ECO mode which I didn’t mind – it doesn’t dull the vehicle’s responses so much that it’s painful to drive, but tries to save a bit of fuel where it can. The 6-speed transmission is smooth, smooth, smooth under any circumstances and relatively quick – I found it to be a pretty well-programmed box, mostly being in the right gear at the right time, though it hunts for higher gears pretty quickly to ease up on the fuel use. If you see the need to, it can be shifted manually using the gear selector. The shifts are actually quite snappy. I found the XL to have a very comfortable ride in the city. Once I got up to higher speeds on the highway, it felt a tiny bit nervous – it’s fine but it needed slightly more inputs than I expected. The handling is quite good for a vehicle of this size. You’ll see lots of body roll, but the turn-in was surprisingly quick and the vehicle was able to hang on to the pavement effectively even during quick, spirited cornering. 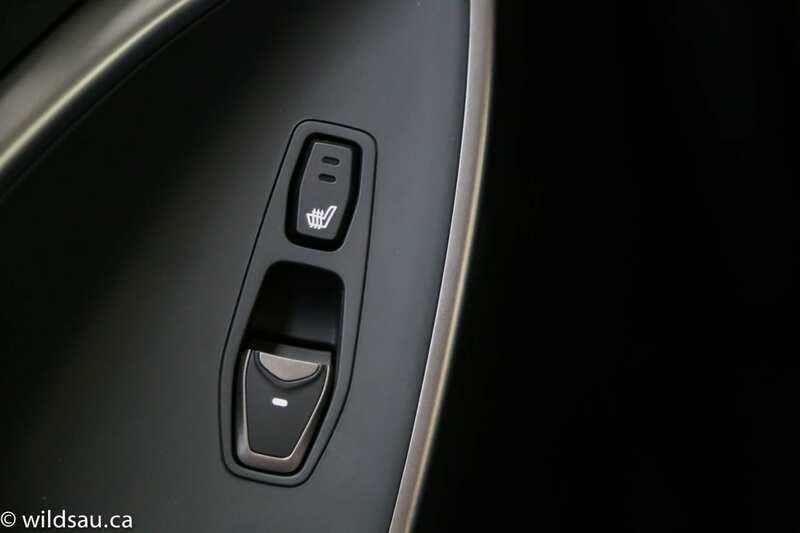 The selectable steering mode allows you to adjust the steering boost between three levels – comfort, normal and sport. To be clear, this doesn’t really change anything in terms of the steering feel – it only changes the amount of boost and therefore the steering effort that is required. I ended up leaving it in sport mode as it was a well-balanced setting. The steering feel is pretty numb, regardless of which setting you choose. The all-wheel drive remains a front-wheel drive system until a loss of traction activates it – it remained completely invisible to me during my review week. That’s a good thing. 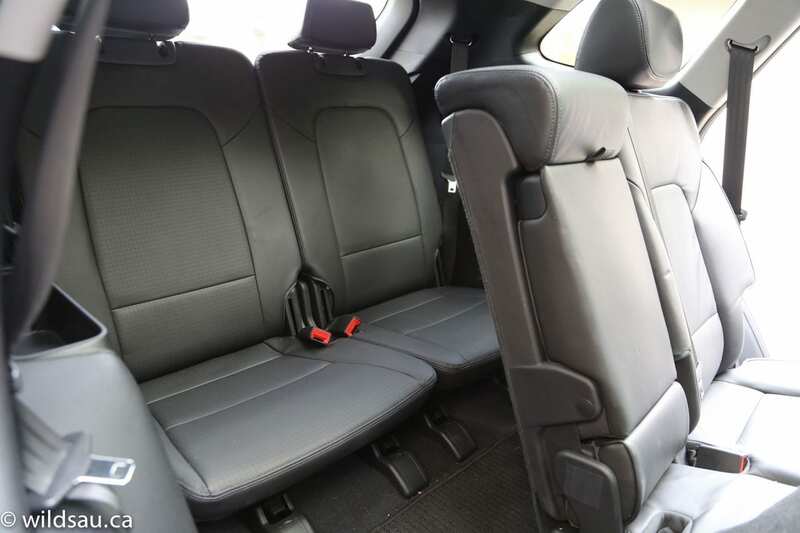 The high seating position gives a nice commanding view of the road, and visibility is great except those rear headrests cut into your view out of the back. Sound levels in the XL are mostly well-managed, but I did find a bit of wind noise and road noise at highway speeds. Nothing disconcerting, but it was there. If you have toys, you’ll be happy to know the XL has a 5000 pound towing. 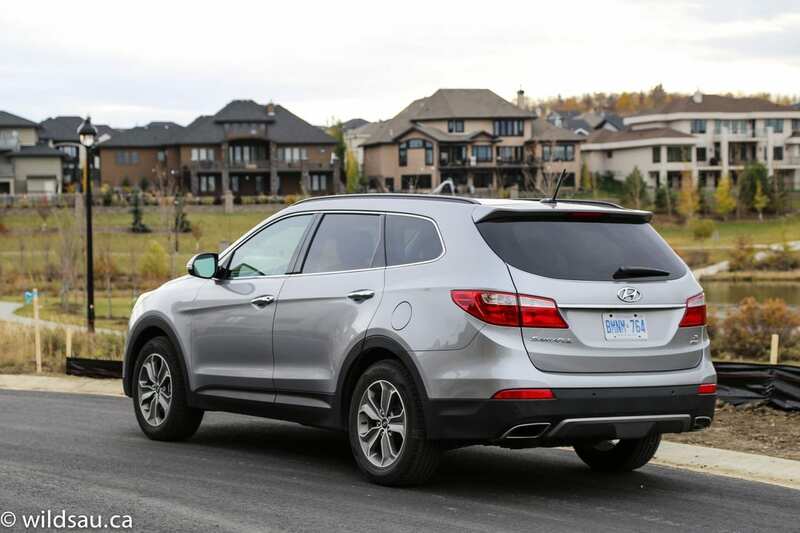 All in all, the Hyundai Santa Fe line is a winner. 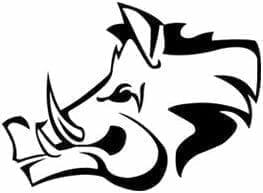 It provides great value, and makes life tough for the competition. Even the base level models are nicely equipped and they do everything very well. 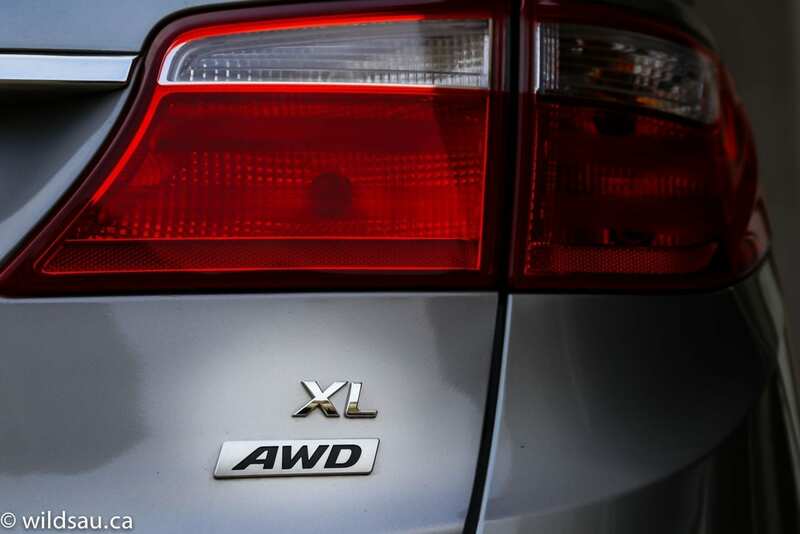 The XL provides a ton of space for second row passengers, cargo and a useful third row, while maintaining a great ride, a good driving experience and acceptable fuel economy. Add good looks, ergonomics and technology into the mix, and I’m left with a vehicle that I wouldn’t hesitate to recommend. 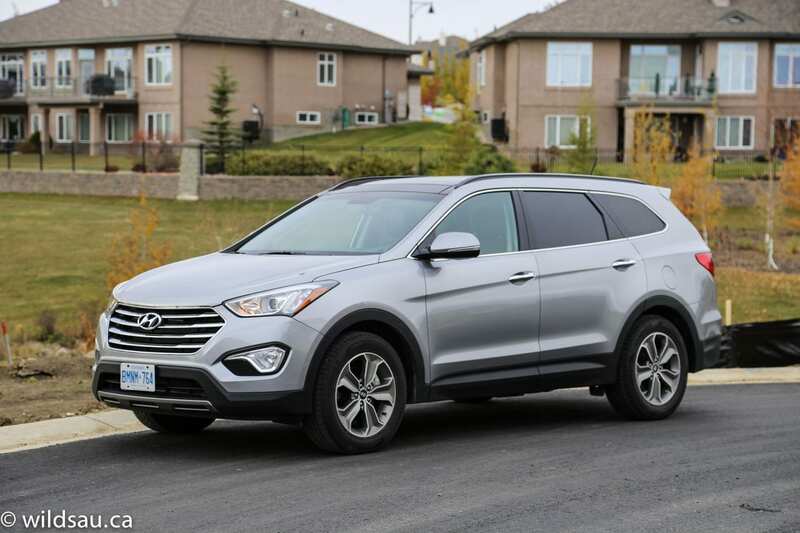 I give the Santa Fe XL an 7.5 out of 10. WAF (Wife Acceptance Factor) was very high. She really liked the styling inside and out, and enjoyed the trunk space for a massive shopping trip (SCREW YOU, TARGET – YOU’RE RUINING MY LIFE!). She even commented that she enjoyed driving it – high praise indeed from a my girl, since she cares little about the driving experience.